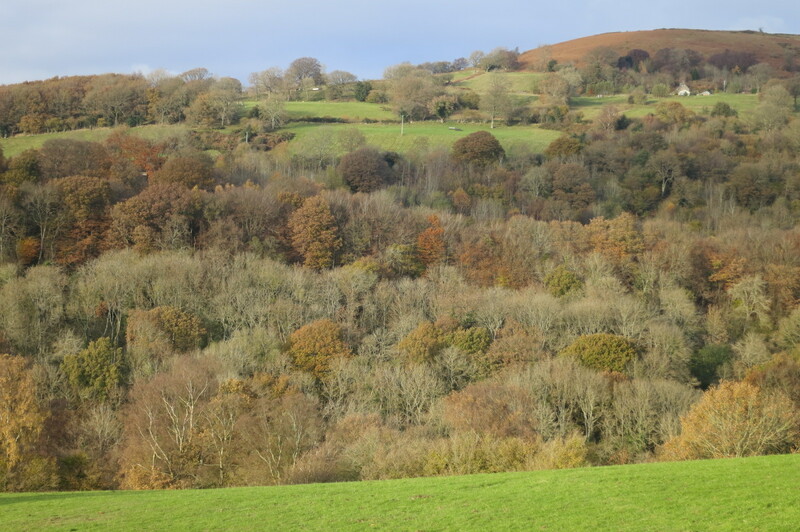 The Llanthony Valley and Sugar Loaf mountain are jewels of the Black Mountains and between the two lies Forest Coalpit a magical valley with Fforest Barn at the end of the lane. 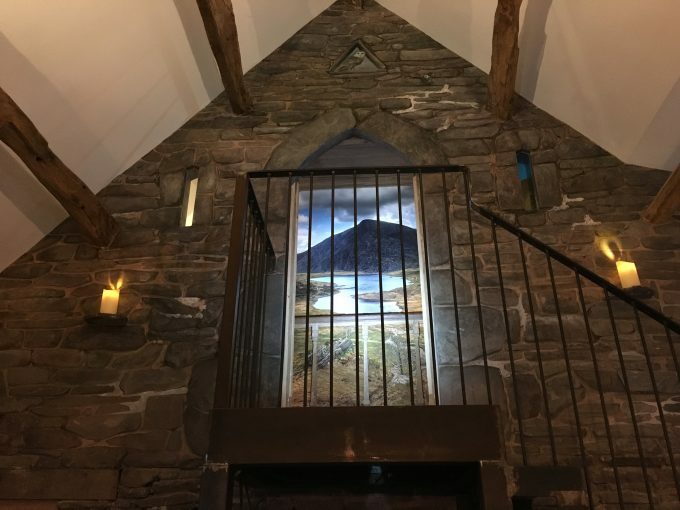 With total privacy, breath-taking views – a forest below and its own wild hill Bryn Awr, out the backdoor – it is the ideal place to rejuvenate, explore and enjoy the Black Mountains. 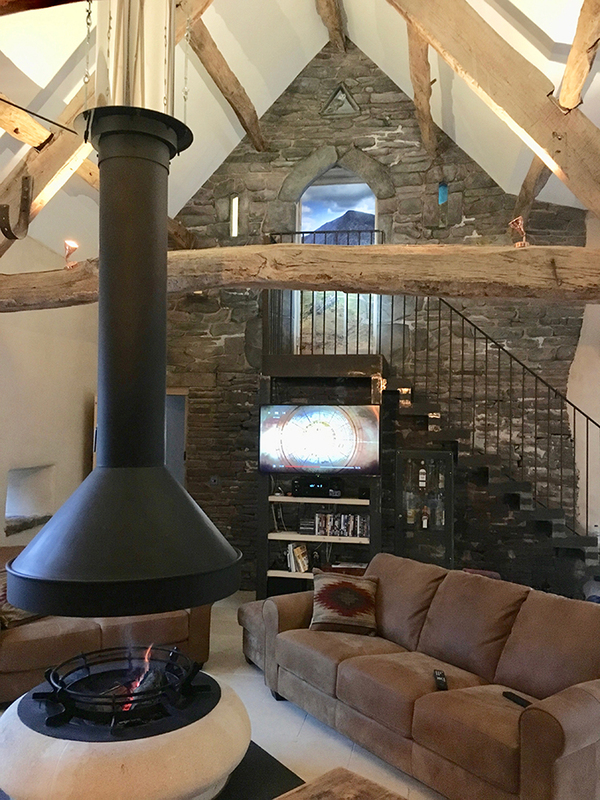 Fforest Barn is perfectly located, equidistant from Abergavenny and the idyllic small town of Crickhowell. 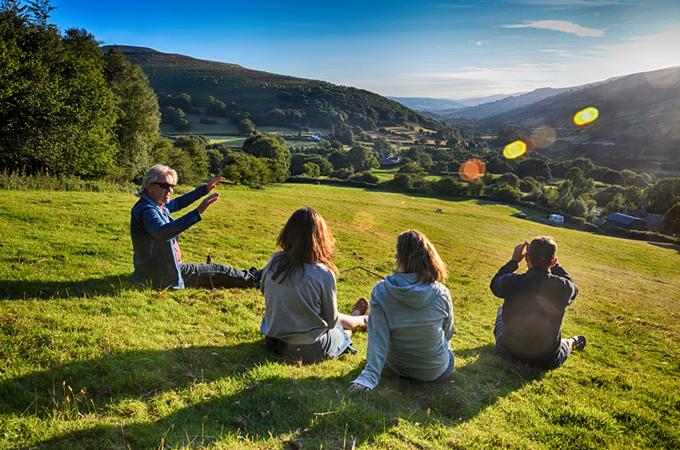 It is minutes from the Llanthony Valley, with stunning walks in every direction, including Sugar Loaf mountain and across Bryn Awr to the best food pub, The Crown, in the region. 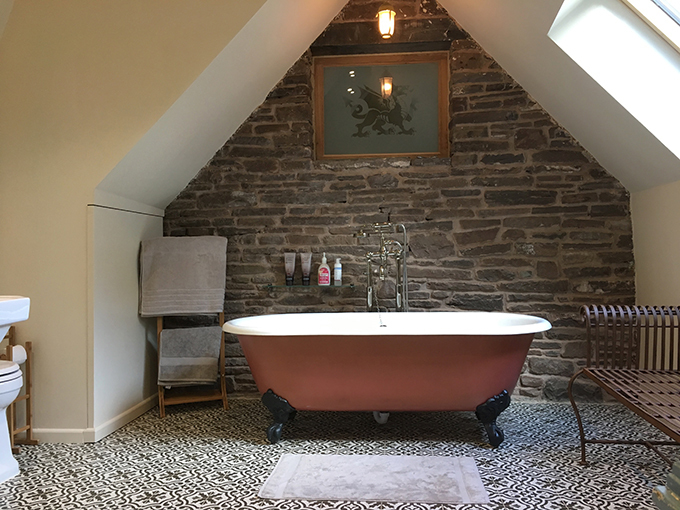 This marriage of a tastefully converted 17th century oak beamed, dry stone wall barn with underfloor heating and a super-insulated Dutch barn, giving the feel of ancient Wales with stunning views in every direction, with all with mod cons, including a hot tub, roll top bath, steam shower, fully equipped kitchen, central open coned fire (Old barn), wood burning stove (Dutch barn) and state of the art AV system for film and music lovers. 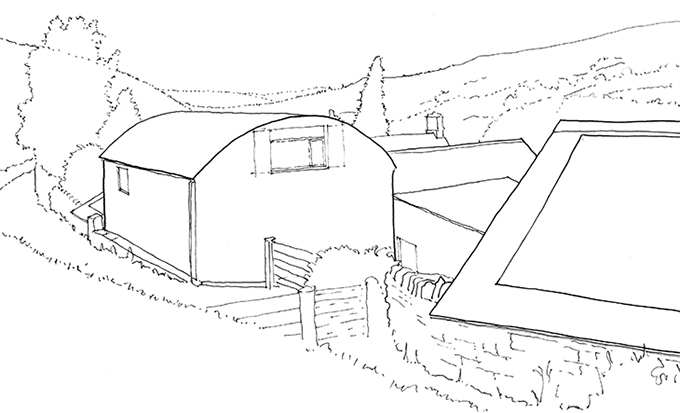 The old barn has two double bedrooms one of which can be made up as a twin. 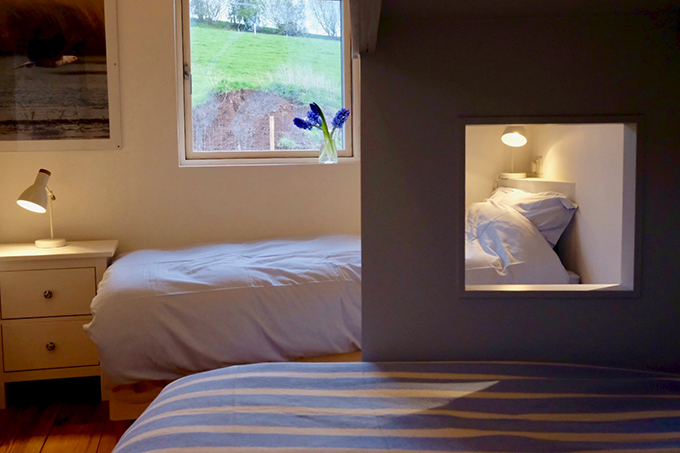 The Dutch barn has one double bedroom with a panoramic view and a bunk bed room which can sleep up to five. 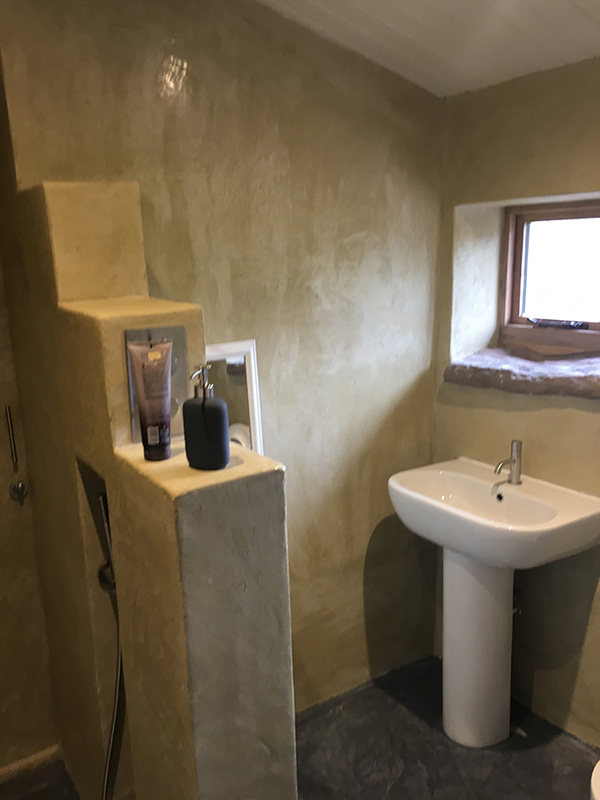 The main entrance connects the two barns also a with loo and steam shower, giving privacy in each barn but easy access between them. 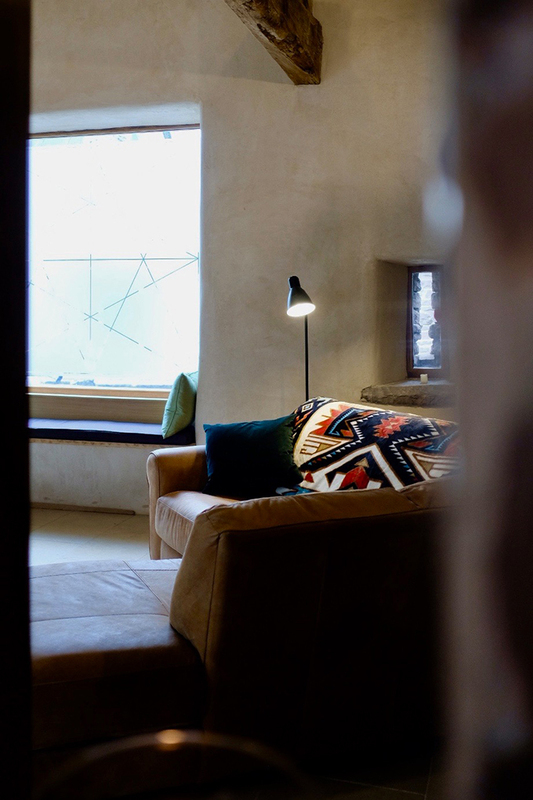 Between the two is a totally private courtyard, creating a big indoor/outdoor space that can be covered with an awning and heated with a space heater. 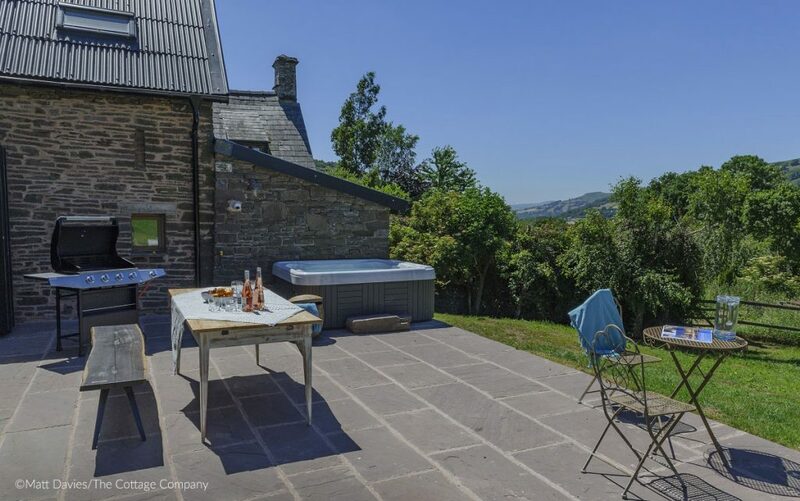 There’s also a panoramic patio leading from the kitchen, with a Barbecue and a HotTub looking over the rolling hills and catching the sunset down the valley. 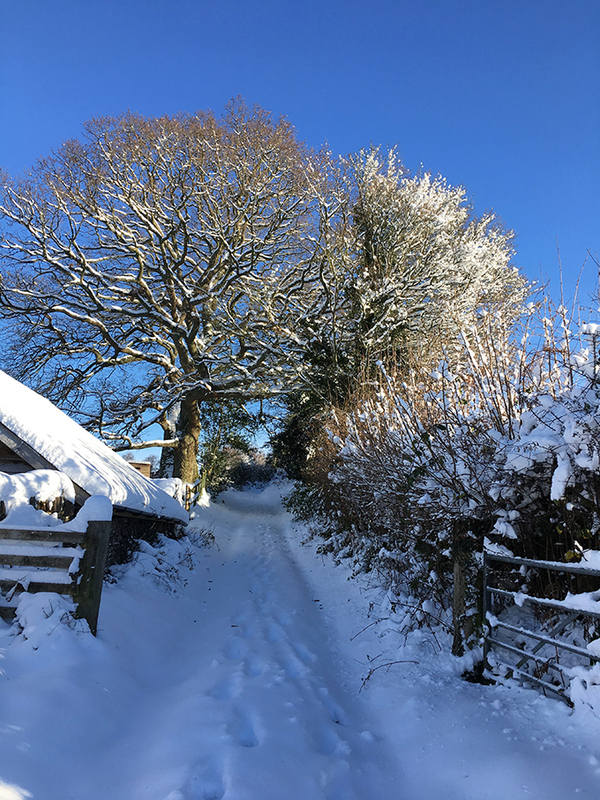 It is perfect for families, parties, events and the Old Barn can be hired on its own for a romantic hideaway. Luxury safari tents are available for larger gatherings, complete with heated beds and an ecoloo. 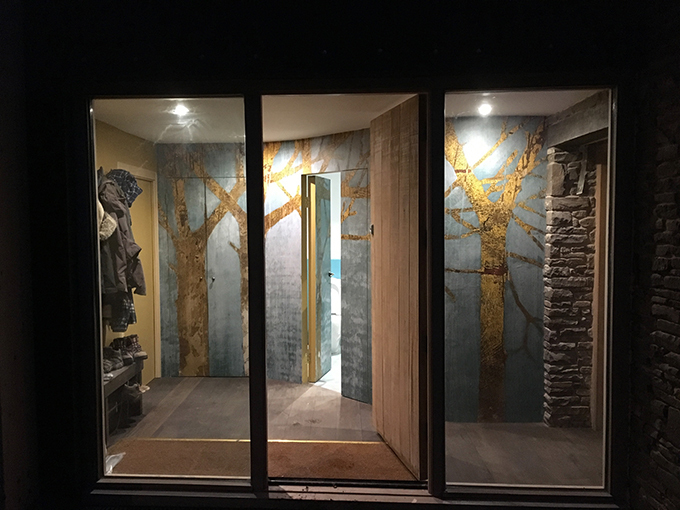 there’s a bathroom with a steam shower (press a button for a turkish bath experience), and a coat room to hang your coats and dry your boots. 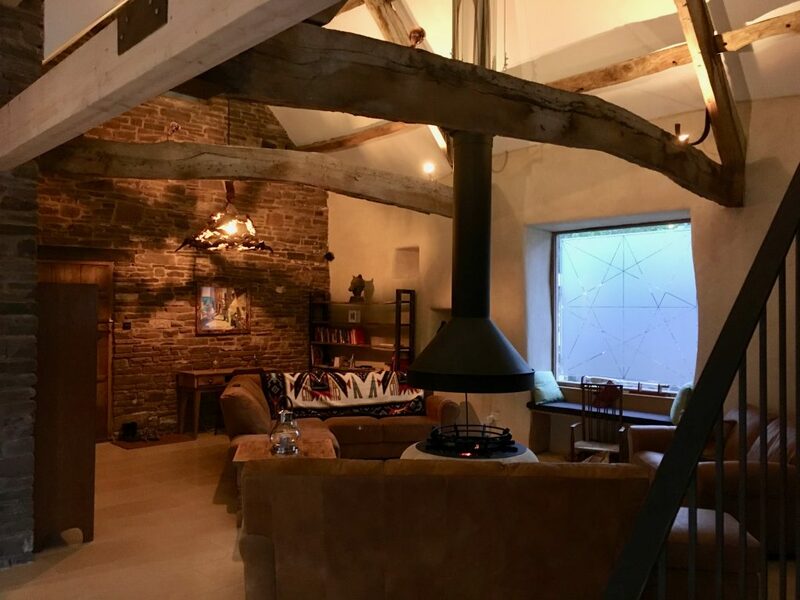 You turn right into the Old Barn living room, which has an open cone fire loaded with wood, with sofas around it and under floor heating. There’s a quadraphonic sound system with a plug in for i-pods, i-pads and computers, and a CD/DVD player and television with Netflix. 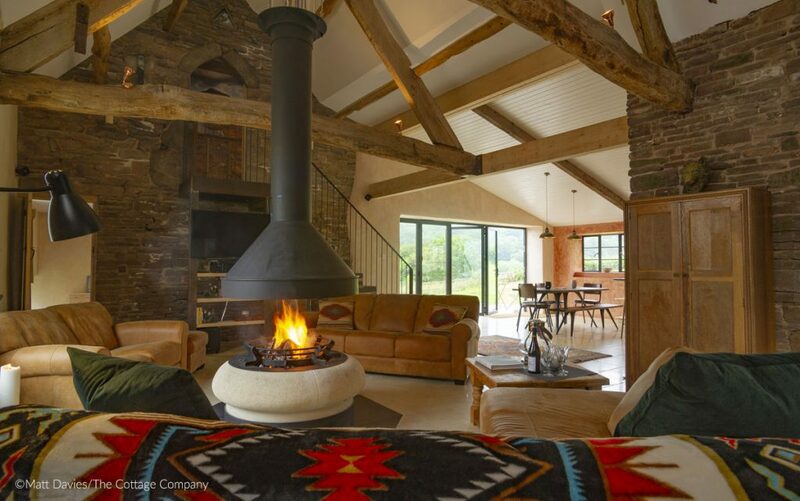 Sink into the sofas and read a book from our library in front of the fire. 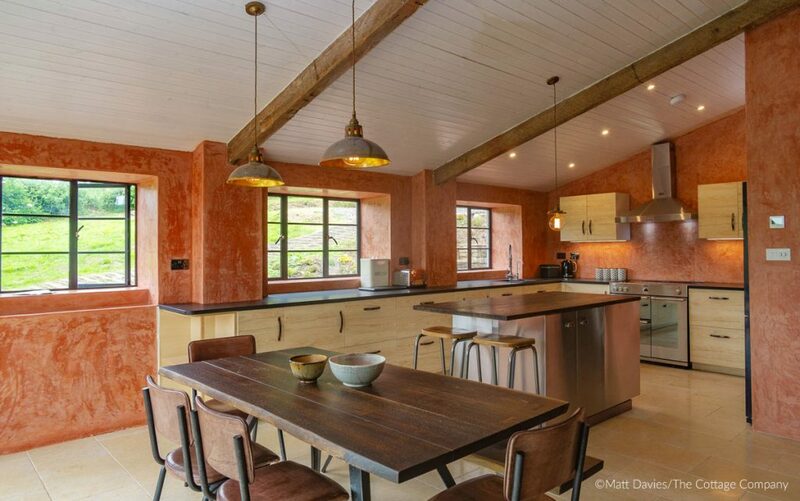 with a dining table that seats up to 8, and folding doors with a panoramic view out onto the patio. There’s a hot tub that seats four people and a barbecue. 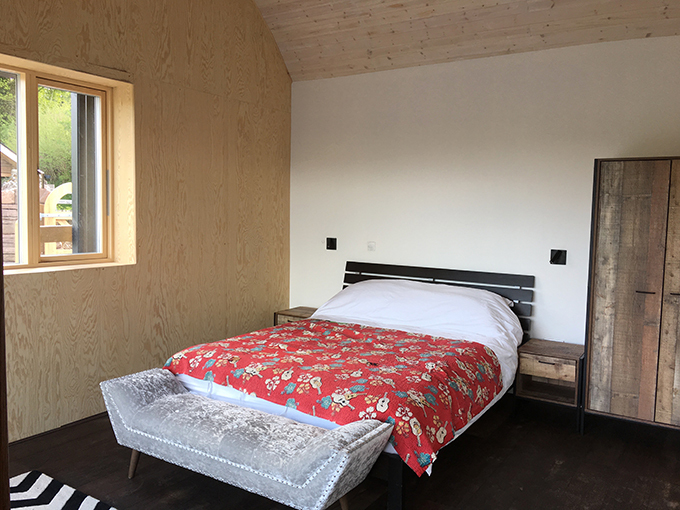 The Master ‘Pigstyle’ Bedroom is off the living room, with an oak wood heated floor. 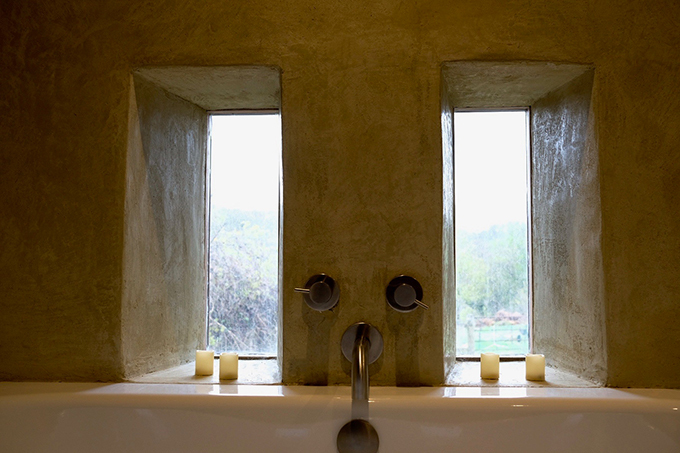 The en-suite bathroom has a bath with an exceptional view from the bath big enough for two. 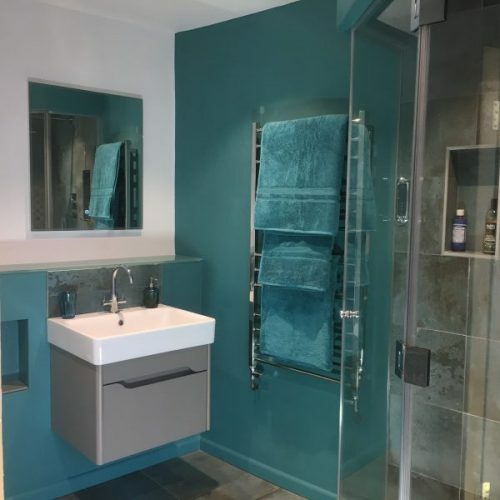 It leads into a toilet, and shower room with private and stunning view across the valley. 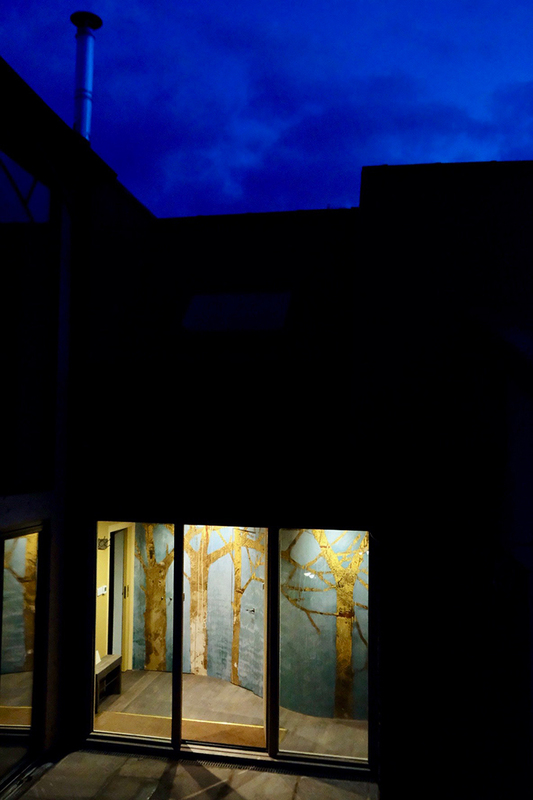 The Loft ‘Owl Nest’ bedroom is accessed up stairs from the living room. 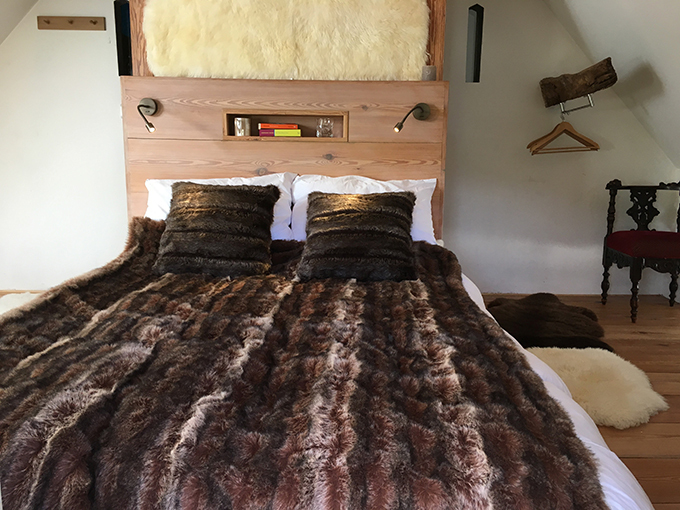 It has a low platform double bed with fluffy sheepskin on the floor and sheepskin behind the oak head board, with recessed sound system with USB connector and flexi- reading lights. 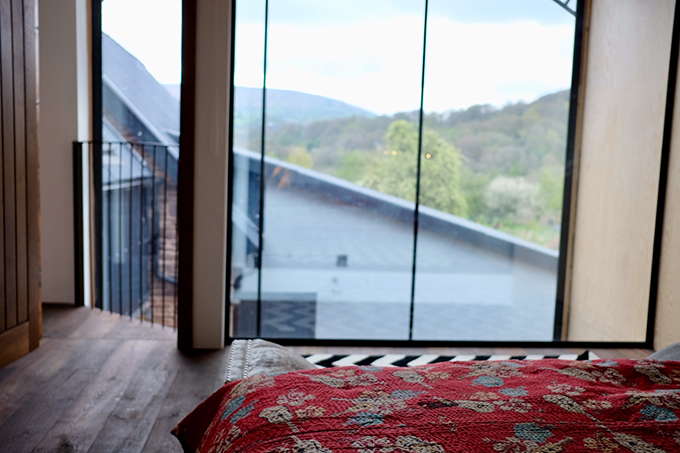 From the double bed theres’ a great view across the valley and a skylight to the stars. 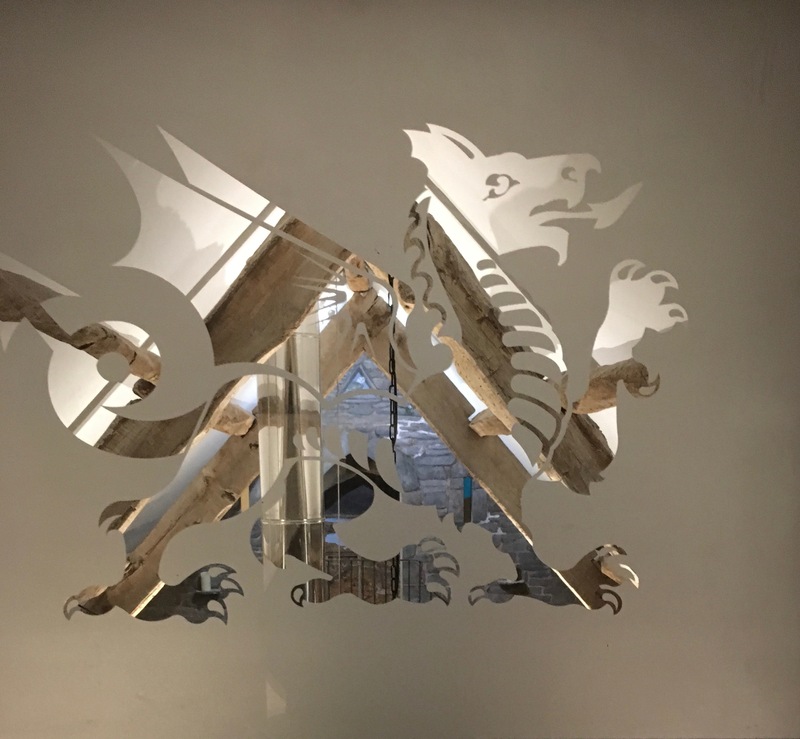 As you enter the Link building there’s a bathroom with steam shower (press a button for a turkish bath experience), and a coat room to hang your coats and dry your boots. The Turn right for the Old Barn, left for the Dutch Barn. 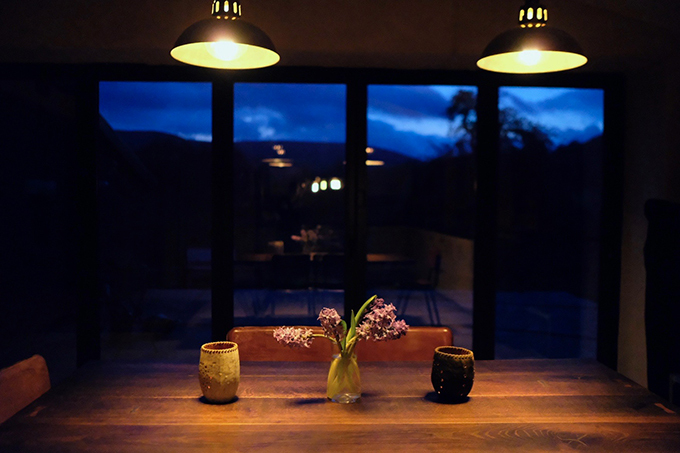 The living room has a wood burning stove, a seating area and a dining table that sits up to 8. 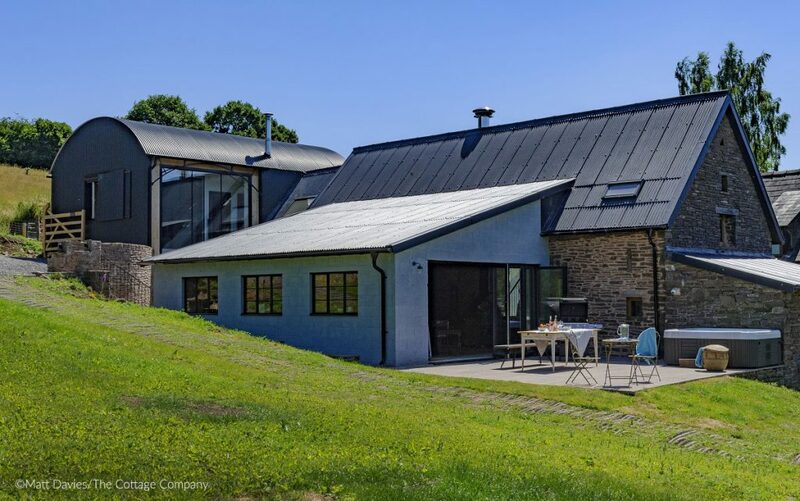 This space has underfloor heating and looks out of folding doors across the courtyard to the rolling hills. 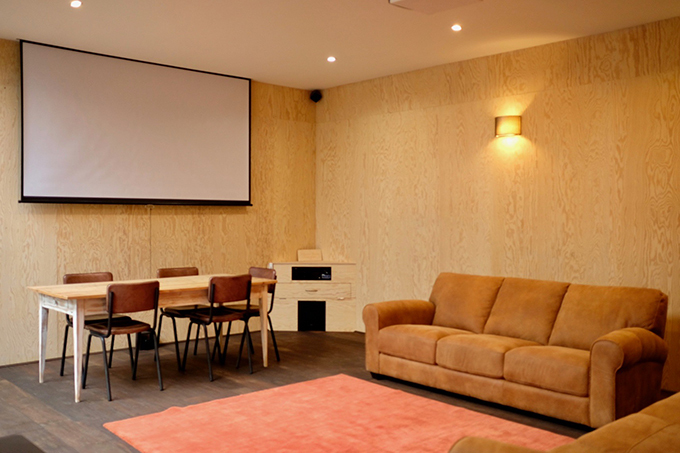 There’s a quadraphonic sound system with a plug in for i-pods, i-pads and computers, and a CD/DVD player and projector to watch TV (with Netflix) and films on the wall screen with automatic black out blinds for a cinema experience. 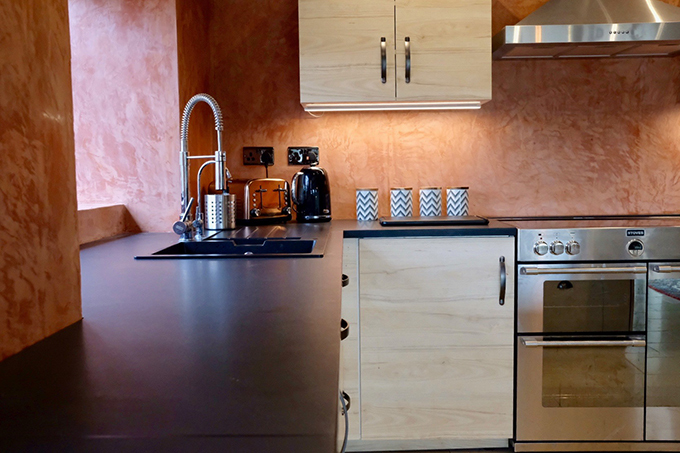 This is the ‘teaching’ space for retreats, able to fit 16 people doing yoga or 25 theatre style. This room can be fully darkened with the press of a button. 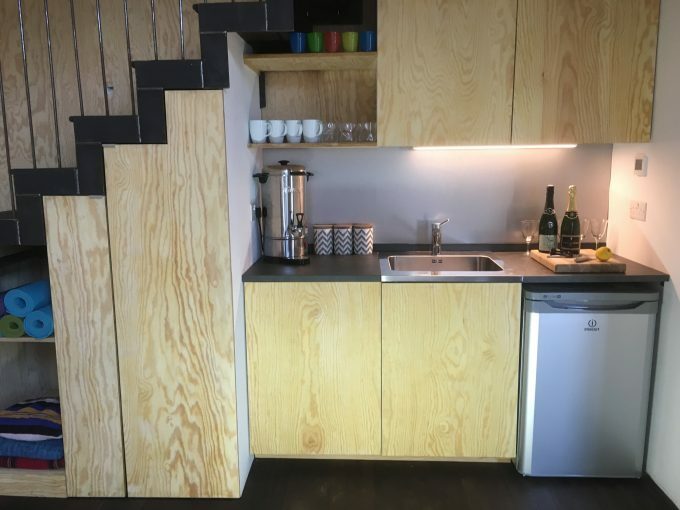 The living room include an area for making drinks and preparing snacks with a kettle, sink and fridge. 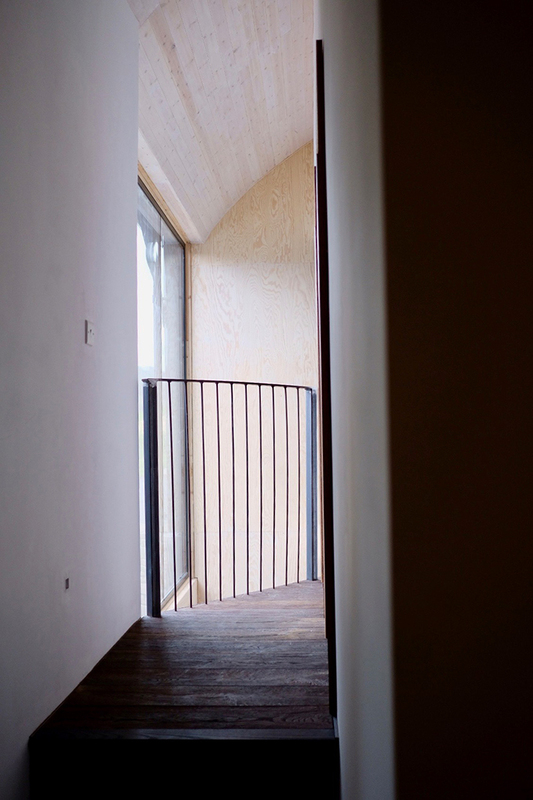 Go up the stairs onto the balcony to access the bathroom and bedrooms. The Twin Peaks Bedroom has a king size double bed looking out across the twin peaks to the North with hanging and storage space for clothes. 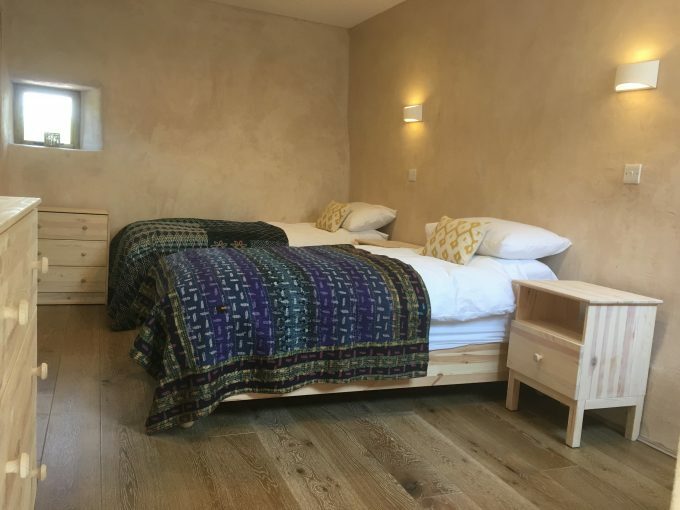 The Bunk House is our bunk bed room, a great space for children sleeping altogether or for larger groups with 3 large singles and a double. It has hanging and storage space for clothes. 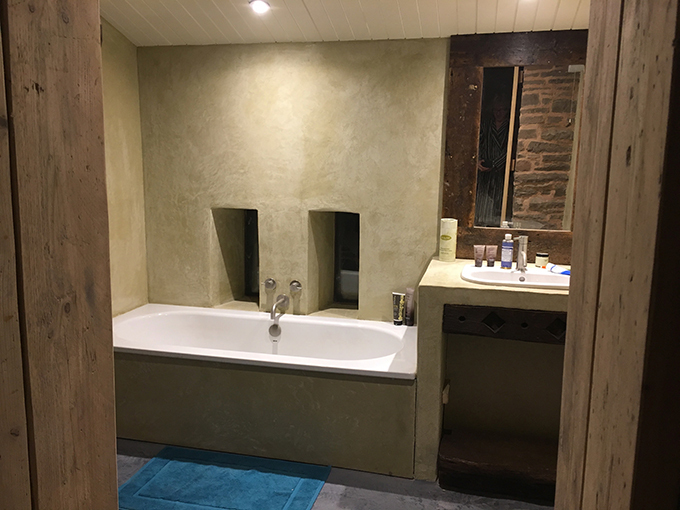 The Bathroom has a roll top bath, hand shower and toilet, with panoramic views. It is shared by both bedrooms. There’s a two car garage with power for charging electric/hybrid cars. There’s space for parking up to six cars. 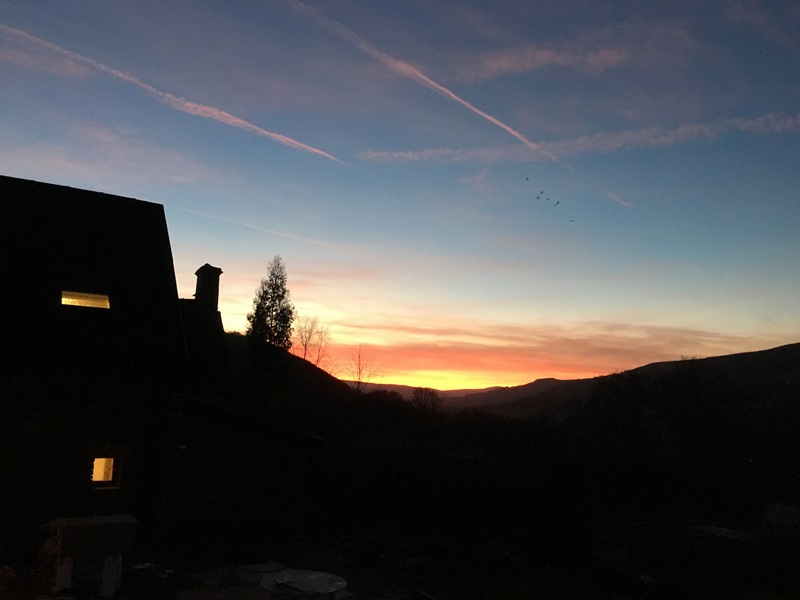 With no light or noise pollution, no sign of roads or cars, a perfect view of the sunset across the valleys, and mountains all around Fforest Barn is all yours to enjoy far from the madding crowd.